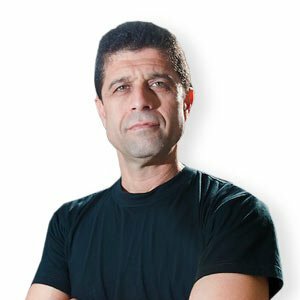 There are few Krav Maga experts who have the martial arts knowledge that Haim Sasson has… more than 40 years in martial arts, Krav Maga black belt from Imi, black belts in other systems and a coach of the Wingate Institute. Haim Sassons expertise covers all sectors of Krav Maga, particularly civilians, women and children. Haim is running his own Organisation, called IKM and trained with the best in the field, including his martial arts Master Jim Keenan, Krav Maga’s founder Imi Lichtenfeld, Imi’s closest students and instructors, and with the Israeli Defence Forces during his time as an Officer in the Army. We are very proud to have him as a good friend and partnership with him, because Haim is in charge of our KIDS-Instructor Courses. Haim has travelled the world as one of the most respected global instructors and created the Dynamight Kids safety and self-defence program that is delivered throughout Australia and now through the KRAVolution Instructors!